Vermont became a state March 4, 1791, the 14th state admitted to the Union. Montpelier is the smallest capital city in population of all 50. It is a quiet little town on the Winooski River, surrounded by the ski resorts of the Green Mountains. 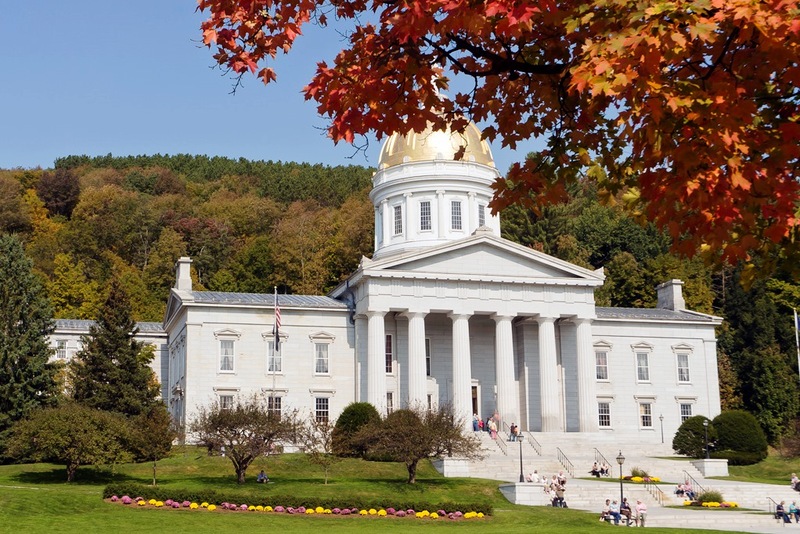 The capitol was built in 1859 of Vermont granite. Its circular drum tower is covered in gold, and supports a statue of Ceres, the goddess of agriculture. All in all, the capitol is 136 feet tall. The town is so compact you can see everything in a 10-minute walk. Then tour a sugar-house at Morse Farm near Montpelier – in the fall you can view the maple-sugar-making process. Fifteen miles away is Stowe, where the Sound of Music’s Von Trapp family operates a resort. In the summer they stage concerts in the meadow at their family estate. Drive another thirty miles and you reach the shores of beautiful Lake Champlain. The Rock of Ages granite quarry at Barre, Vermont is one of the world’s largest. The green velvet chairs in the capitol, inviting a sit in the legislative chambers, at the front if you like; Sunday’s culinary brunch at NECI; the Rock of Ages marble works; the Morse Farm Maple Sugar Shack; the tiny town and mountain surround. Mountains near: Green Mountains. Mount Mansfield in the northwest part of the state is the highest point in Vermont at 4,393 feet.